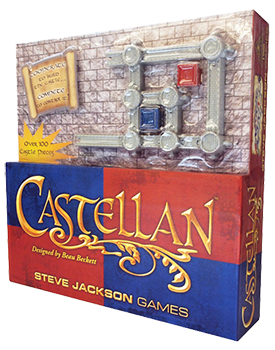 Daily Illuminator: Be The Architect With Castellan! December 11, 2017: Be The Architect With Castellan! Feel like giving your noggin some exercise? Try Castellan on for size! Designed by Beau Beckett, Castellan is a really fun way to strengthen your spatial-awareness skills. Two players work together to build a castle. As you add walls, you enclose courtyards that you claim with a Keep. Every tower in that courtyard gives you points! The game comes with cards that determine what pieces you can use each turn, but you need to plan the best way to place them. This game speaks to those who want to build their strategy skills in a fun way, since you can and should plan your moves to get the most points while blocking your opponent from scoring. The game's plastic components are beautifully detailed, letting you see your courtyards grow in the course of the game. Castellan is perfect for families - it keeps adult minds sharp and helps kids grow their spatial ability while giving them something tangible to play with. (Okay, the play value is good for adults, too.) Plus, its simple mechanics are easy to learn. Castellan received a Recommended designation by Mensa in 2015, so you know it's good for your little one's brain! Plus, if you also buy the international edition, you can expand the game to include up to four players. Those who love strategy and building things will find this satisfyingly challenging, no matter your age. It's an engaging way to exercise your brain – your most important body part, without question! To see more of the components and get a quick rules rundown, like our Facebook page and watch our #SJGamesLive stream, featuring a Castellan unboxing and how-to-play! So hurry up and get Castellan at your friendly local game store or Warehouse 23.